Today starts the first challenge of this year on Magnolia-licious challenge blog. We have a nice and easy theme for you - anything goes. Just remember you have to use Magnolia, Stamping Bella, Whimsy stamps or CC designs stamp on your project to be in the chance to win an amazing prize from Magnolia-licious store. I decided to make a get well card. I never have one of those on hands, but I think they can be very handy sometimes. 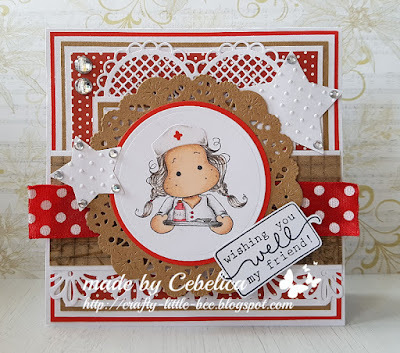 On my card I used Nurse Tilda stamp from Get well collection. I also used cap and little cross die that came with the collection. I did the colouring with Promarkers and pencils. Papers and embellishments came from my stash. I hope you will come play with us. What a beautiful get well card. It's definitely something I never have ready! I love your embossed stars and the image is coloured beautifully. Hoping 2018 is a good year for you. This card would cheer anyone up. Love the colour combo and the pretty layout and embellishes teamed with that adorable image.. lovely ! Such a gorgeous card Cebelica!! I love this Tilda and your design is absolutely gorgeous. Thank you for sharing with us at Creative Inspirations, good luck and I hope you will join us again. Maya, Your card is WONDERFUL. I love the colours and simple nature of the card that sets Tilda off so very well. Your embellishments are perfect - love all the dies you have used. Your colouring is awesome. Cute image, lovely colouring, beautiful card! A super creation for our 'Something New' theme at Allsorts, many thanks for joining in. Popped back Cebelica as not sure if I also said thank you for sharing with us at Penny Black and More. 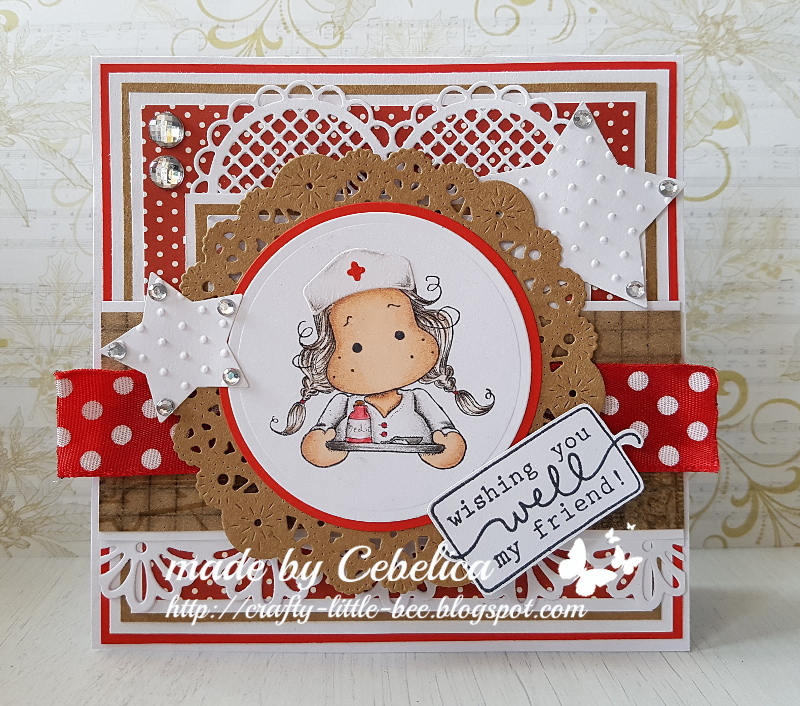 Great coloring of nurse Tilda, Cebelica! Gorgeous card. what a sweet card! someone will appreciate this and feel better realizing how thoughtful! thank you so much for playing along with us at the penny black and more challenge.